We are the leading source of thickness gages for the accurate measurement of nearly any material. Thickness gages include a wide range of features available for enhanced gage performance. Ultrasonic thickness gages can measure virtually most materials such as plastics, metals, metal composites, rubber and internally corroded materials. The 27MG is a basic ultrasonic thickness gage designed to make accurate measurements from one side on internally corroded or eroded metal pipes and parts. It is lightweight, durable, and ergonomically designed for easy, one-hand operation. The 45MG is an advanced ultrasonic thickness gage packed with standard measurement features and software options. This unique instrument is compatible with the complete range of Olympus dual element and single element thickness gage transducers. The versatile 38DL PLUS can be used with dual element transducers for the measurement of corroded pipes to the very precise thickness measurements of thin or multilayer materials with a single element transducer. The Magna-Mike is a Hall Effect thickness gage that uses a magnetic probe to perform accurate measurements on nonferrous and thin materials such as plastic bottles. The 35RDC is a simple Go/No-Go ultrasonic gage designed to detect subsurface defects caused by impact damage on aircraft composite structures. 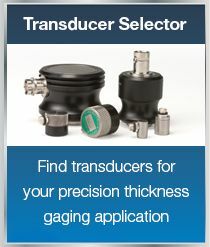 Olympus offers a variety of single and dual element transducers and accessories for precision and corrosion thickness gaging.